Polish singer with a lyric baritone voice. A legendary artist of pre-war Warsaw cabarets and revue theatres who continued his career after the war, Fogg excelled at the sentimental song genre. He was known for his excellent technique and the elegance of his performances. Fogg’s career lasted sixty years (he performed until the age of eighty-six), an unprecedented achievement in the history of Polish stage. Polish singer with a lyric baritone voice. He was born Mieczysław Fogiel on 30th May, 1901 in Warsaw, and he passed away in the same city on 3rd September, 1990. Always loyal to his native city, Fogg was popular with several generations of listeners in Poland and abroad. He performed famous tangoes in a unique way and reached people’s hearts with his songs about love. His best known hits were the Tango milonga, To ostatnia niedziela (This Is the Last Sunday), Jesienne róże (Autumn Roses), Mały biały domek (Little White House), Już nigdy (Never Again), Pieśń o matce (A Song About the Mother). Mieczysław’s mother was a storekeeper and his father was a first-class driver in a railway company. Fogg attended a technical secondary school on Jezuicka Street. In 1910, he joined the Polish boy scouts. As he entered adulthood, he enlisted in the Polish Army (1919-1921) and took part in the Polish-Soviet War of 1920. In 1922, Fogg began working in the Warsaw Directorate of the Polish State Railways, a form of making amends to the ambitions of his father, who wanted him to pursue a career in engineering, transportation and roadbuilding. From his early years, however, Fogg wanted to devote his life to music, and maintained a belief in his talent. Initially, he sang in church choirs, where he was noticed by Ludwik Sempoliński, who told him he should seriously consider an education in singing and sent him to Jan Łysakowski, a professor at the Department of Vocal Sciences of the Fryderyk Chopin Music School in Warsaw. Fogg’s ambition and talent were supplemented by hours of meticulous study: note reading, diaphragm exercises, back to note reading, and so on. 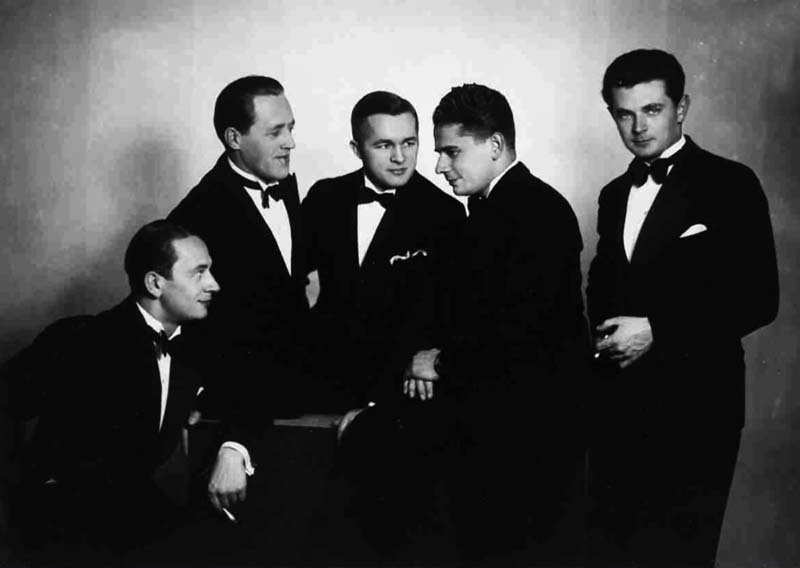 His next musical mentors included Eugeniusz Mossakowski (1926-28), Michał Ardatti (1928-29), Anna Floriani-Zbierzchowska, Wacław Brzeziński, Ignacy Dygas, Stefan Belina-Skupiewski, Stanisław Kopf, and Adam Didur. Fogg began to earn money by singing at weddings and funerals, but, since the money did not cover the costs of his education entirely, he also had to moonlight as a claqueur at the opera. After one of our shows, a man with a benevolent smile visited us in the backstage. ‘I really liked your jazz versions of the folks songs’, he said with admiration. The man’s name was Karol Szymanowski. Fogg’s first albums with Dan’s Choir were recorded in July 1929, and his solo albums followed in March 1930. He toured with the choir in Estonia, Latvia, the USSR, Finland, Sweden, Norway, Austria, Czechoslovakia, Romania, France, and Italy. He received a wealth of offers. When the troupe were on their way to the United States aboard the Ile de France, a ‘duel’ ensued with one of the best US revellers groups, the Mill Brothers. Dan’s Choir won 3:1 in encores. In 1931, Fogg took part in music radio shows organized by the Gebethner and Wolff publishing house and began to give radio recitals. He performed on stage with Stanisław Nawrot’s orchestra, to the accompaniment of Ludwik Urstein. Fogg stayed with Qui Pro Quo until 1933 and later associated with other theatres and revues. He finally left Dan’s Choir and redirected his efforts into his solo career, recording up to 150 songs in a year. ‘In the 1930s, I signed contracts for a hundred songs per year. I exceeded that limit by fifty and earned the nickname, <worker ant>,’ he recalled later. He collaborated with famous cabaret artists, both on stage and in recordings: he worked with Hanka Ordonówna, Stefcia Górska, Zula Pogorzelska, and Adolf Dymsza. He also set a record in prewar music sales with his To ostatnia niedziela album, which sold in more than 100,000 copies. In 1937, Fogg won in a country-wide vote of the Polish Radio listeners for the most popular singer, gathering almost 50,000 votes (out of the 150,000 cast in total). He opened his two-week tournée in the United States with a performance in New York on 12th October, 1938, and went on to sing in the Rivoli theatre in Buffalo, NY, and the Congress theatre in Chicago, as well as Detroit, Cleveland, Boston, and Philadelphia. He also recorded an album for the famous record company RCA Victor. Fogg was the first Polish artist to perform live on TV when he sang in London in 1939 in a British TV studio. On the eve of the war, Fogg performed as Chamberlain at the Ali Baba cabaret theatre in a revue show Orzeł czy Rzeszka (Eagle or the Reich, a play on the Polish expression for ‘heads or tails’). The next show, Fakty i pakty (Facts and Pacts), opened on 31st August, 1939. On 4th September, a bomb turned the theatre to rubble. In the first days of the war, Fogg performed for the Polish military. ‘Hanka Ordonówna called me on September 1. <Mieciu>, she told me in an excited voice. <Let’s go to the railway stations, let’s sing for the wounded soldiers!> … As soon as the first train with the wounded entered the station, we started going from car to car, singing songs. The soldiers, many of them with bandaged wounds, were exhausted but fearless. <We won’t give up!> they shouted,’ he recalled. Fogg left Warsaw on 6th September, 1939, together with a group of actors from the Association of Polish Stage Artists (ZASP). He reached Lviv, where he performed for the radio and revue shows in the Stylowy nickelodeon until 29th October, 1939. He returned to Warsaw, where he spent the years of the German occupation. During that time, he performed in coffee houses that were open to Polish citizens. The spontaneous reactions of the audience to Fogg’s first occupation-era song, Ukochana, ja wrócę (I’ll be Back, My Love), sung to the music of Tadeusz Müller and with the lyrics written by Eugeniusz Żytomirski, attracted the attention of a drunk Gestapo member who aimed his gun at the performer. Fogg, who was shortsighted, did not react, but the German officer chased him backstage, where, thankfully, the woman he came to the club with wrestled the gun out of his hands. The artist was called in for an interrogation to the Gestapo, where, luckily, he managed to talk his way out of the situation. The Home Army (AK), a Polish resistance group, warned the singer that Germans had been observing him for some time. He temporarily suspended his singing career and worked for a while as a waiter. Fogg, who was a member of the AK, helped organize clandestine instruction and performed during the Warsaw Uprising to uplift the fighters and civilians in the city. According to the archives, he performed 104 times in war shelters, field hospitals, and at the barricades. He was wounded several times and was later given the Cross of Valour and—as the fourth Pole—the Gold Cross of Merit with Swords, an award of the Polish Government in Exile. His armband from the Uprising is now part of the collection of the Warsaw Uprising Museum. During the occupation, Mieczysław Fogg shielded his Jewish friends in his apartment. The Yad Vashem Institute in Jerusalem awarded him the Righteous Among the Nations medal. A little over a year had passed and, upon the advice of my doctor, I had to close the coffeeshop. Working and singing in the smoke-filled building was dangerous to my health, not to mention my voice. At the turn of 1958, Fogg toured the United States, Canada, the United Kingdom, and France. In 1958, he repeated the success of twenty-one years prior, winning the Polish Radio’s vote for the most popular singer. In his next tournée, he visited Australia, New Zealand, and Tasmania. On his way back to Poland, he gave a recital in Jakarta. In 1961, he played concerts in Brazil and in 1963, in Finland and the United States, for the fourth time. He also visited the USSR, in 1969 he performed in Denmark. He went to the US again in 1970 and 1972. When Maurice Chevalier died in 1972, Fogg became the oldest performing singer in the world. In Poland, he was a guest performer at the Syrena Theatre, as well as at a number of shows. Together with the Chmielna Street Orchestra, he raised funds for the reconstruction of the Royal Castle in Warsaw. He last performed publicly in 1988. His voice was immortalized on albums published in Poland and abroad, including the United Kingdom, the USA, and Australia. The total count of his albums exceeded twenty-five million copies. He produced many records with the orchestras of Zygmunt Karasiński, Stanisław Nawrot, Jan Cajmer, Władysław Kabalewski, Tadeusz Sygietyński, Władysław Skoraczewski, Jerzy Harald, Stefan Rachoń, Piotr Szymanowski, Tadeusz Suchocki, Jerzy Abratowski, and Marek Sewen. The songs of Mieczysław Fogg, propelled by the wave of the so-called retro-pop, have found their way to the repertoire of artists working on club music, such as Cinq G, The Bumelants, DJ Twisters, as well as Aleksandra Nieśpielak, Marysia Sadowska, and Mika Urbaniak. The most popular songs were recorded on the album Fogga Ragga (Cinq G, 2006), as well as Café Fogg (2008) and Café Fogg 2 (2009), published on the initiative of Michał Fogg, the grandson of the artist and consisting of remixes and arrangements of Fogg’s songs, as performed by various singers. 'The strength of my grandfather’s art was that as the decades passed, he stayed true to his style,’ Michał Fogg says. ‘Many tried to convince him to change with the times, but he refused. He incorporated many innovations, but the only compromise he ever agreed to was his collaboration with the big-beat bands such as Klipsy i Karaty and, later, Baby Jagi, whose music he complemented with his sentimental tunes. The Mieczysław Fogg Polish Festival of the Retro Song has been taking place since 2004, supported by the Ministry of Culture and the Fogg family. Author: Janusz R. Kowalczyk, August 2013. Translated by AM.